Above: A publicity portrait of Kane Richmond from the serial Haunted Harbor (Republic, 1944). When serial buffs name their favorite heroes, Kane Richmond invariably places close to the top; in fact, he’s usually ranked second, right behind Buster Crabbe. This is a strong testament to Richmond’s screen presence and charisma, considering that, unlike Crabbe, Ralph Byrd, and other leading men, Richmond starred in only one really popular and well-remembered serial. However, his performance in that outing, and equally good performances in lesser cliffhangers, have earned him enduring popularity. Physically and facially, Richmond resembled a 1930s pulp magazine or comic strip hero come to life. He was also a good actor, and could convey both an unassuming sense of humor and a quiet, resolved determination. His looks and his pleasant personality made him a perfect serial hero, one who could elevate even the weakest vehicles. Richmond was born Fred Bowditch in Minneapolis in 1906. While not much data on his early life exists, it appears he displayed considerable athletic prowess in high school, attended the University of Minnesota, and made his way to Hollywood around 1925. He worked as a gas station attendant in Los Angeles, then a film salesman, before breaking into the movies in 1929. He worked as an extra in his earliest pictures, then starred in a series of short boxing films for Universal, playing a fighter named “Kid Robertson.” In 1931, he was signed to a contract by Metro-Goldwyn-Mayer; the studio used him primarily in background parts, as they did most of their rookie actors. In 1932, Richmond was offered the lead in the 20th-Century Fox film Devil Tiger, and opted out of his MGM contract in order to accompany the Devil Tiger crew to Malaysia. The film was planned as a location-filmed jungle movie to rival MGM’s Trader Horn, and Richmond hoped that, if it proved successful, it could jump-start his career and save him a slow climb to bigger parts at MGM. However, Devil Tiger’s production was plagued by illnesses, accidents, and other difficulties, and wound up taking almost two years to complete. When the picture was finally released in 1934, it only met a modest success, and was unable to bring Richmond back to the attention of the major studios after his long absence from America. He was now in the same position he had been two years ago, only without a contract to rely on; he freelanced in small parts for various studios before starring in his first serial, The Lost City, in 1935. The Lost City was concocted by independent producer Sherman S. Krellberg, and was possibly the strangest cliffhanger of the sound era. The plot had Richmond, as an electrical engineer named Bruce Gordon, traveling to Africa to investigate a series of world-threatening atmospherical catastrophes emanating from a point in the jungle. Richmond quickly discovered that the man behind all the trouble was Zolok (William “Stage” Boyd), the ruler of a jungle lost city and a certifiably mad scientist. Gordon soon found himself dodging Zolok’s monstrous native henchmen, battling a crooked slave trader, and taking on several jungle tribes, all the while trying to rescue Dr. Manyus (Josef Swickard) and his daughter Natcha (Claudia Dell) from the clutches of Zolok and other villains equally bent on exploiting Manyus’ scientific knowledge. Lost City featured better-than-average sets and an unusually large cast for a serial, but its meandering and bizarre script and its wildly melodramatic acting, apparently insisted on by director Harry Reiver, turned it into more of a curiosity than a success. Richmond, like most of the cast members, overacted vehemently and uncharacteristically throughout, over-dramatically waving hands or clenching fists, and hammily shouting defiances as he went about his heroics. He relaxed into his more normal manner on a few occasions, but on the whole his first serial performance–unlike his subsequent ones–came off as pretty risible, though still somewhat appealing by virtue of its melodramatic energy. Above: Kane Richmond at an apparent disadvantage in The Lost City (Krellberg, 1935). Above, from left to right: Eddie Fetherstone, Josef Swickard, Claudia Dell, and Kane Richmond in The Lost City. Shortly after finishing The Lost City, Richmond signed with Mascot Pictures to appear in The Adventures of Rex and Rinty (1935). This pleasant but bland and rather unexciting cliffhanger was primarily a vehicle for its animal stars, Rin Tin Tin Jr. (as Rinty) and Rex, King of the Wild Horses (as Rex). Richmond played Frank Bradley, a polo champion trying to return the valuable horse Rex to his native island of Sujan, where he was held sacred and from which he had been stolen by a pair of crooks. Ruthless polo-playing tycoon Harry Woods was out to get Rex by hook or crook, but Richmond, aided by Rinty and a mysterious emissary from Sujan, finally returned the horse to his rightful home. Here, unlike in City, Richmond was allowed to be his usual likable and congenial self; his athleticism and affability suited him well for the part of a cheerful sporting daredevil, and he avoided being overshadowed by his animal co-stars, although both received more screen time and were billed ahead of him in the credits. 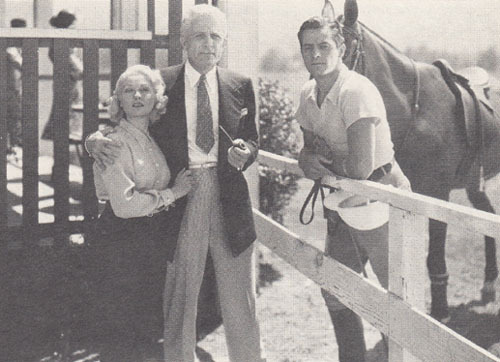 Above: Norma Taylor, Allen Cavan, and Kane Richmond with Rex, King of the Wild Horses, in the background in The Adventures of Rex and Rinty (Mascot, 1935). Above: Rin Tin Tin Jr. rescues Kane Richmond in The Adventures of Rex and Rinty. In 1936, Richmond began starring in a series of B-films for the low-budget Conn Pictures; most of these were sporting dramas that co-starred juvenile actor Frankie Darro. Titles included Racing Blood, Born to Fight, and Headline Crasher. After concluding this series with Young Dynamite in 1937, Richmond appeared in his third serial, Flash Gordon’s Trip to Mars (Universal, 1938). Richmond played a supporting character in this outing, a Martian “stratosled” captain who figured prominently in the serial’s later chapters. Richmond’s character served Azura, Queen of Mars (Beatrice Roberts), an ally of Ming the Merciless (Charles Middleton) and an enemy of Flash Gordon (Buster Crabbe). However, Richmond changed sides when he discovered that the double-dealing Ming had tricked him into killing Azura in a bombing raid, and found that his brother, turned into a “Clay Man,” had been restored to his true form by Flash. He joined forces with the good guys to stop Ming from assuming the throne of Mars, and proved of pivotal assistance in thwarting the villain at the climax. Richmond’s part was small, but more complex than many serial supporting roles. He handled it well, bringing genuine feeling to his reunion scene with his brother and reacting with convincing sorrow when his character realizes that he has bombed his own Queen. Above, from left to right: Buster Crabbe (kneeling), Jean Rogers, Donald Kerr, Richard Alexander, and Kane Richmond in Flash Gordon’s Trip to Mars (Universal, 1938). In 1939, Richmond began working steadily in 20th Century Fox’s B-movies, starring in a few films like the crime drama The Escape, but usually taking major supporting roles in the studio’s various mysteries and Westerns–among them three Charlie Chan films, a Cisco Kid movie, and George Montgomery’s first starring film Riders of the Purple Sage. He also found work in Warner Brothers and RKO films during this time, including a bit as one of Notre Dame’s “Four Horsemen” in Warners’ Knute Rockne All American. After several years in features, he returned to serials in 1942 to star in the best cliffhanger of his career, Republic Pictures’ wartime espionage thriller Spy Smasher. Spy Smasher was released when Republic Pictures was at their serial-making peak; the studio had honed its action scenes to thrilling perfection, but had not yet begun to emphasize action at the expense of characterization, as they would within a few years. Richmond, who could handle both action and characterization, was just the leading man the serial needed. He played two roles in the cliffhanger: Alan Armstrong, a war correspondent who assumed the identity of Spy Smasher to battle Nazi agents, and Jack, Armstrong’s twin brother, who joined Alan in his campaign and saw almost as much action as his brother did. Richmond, playing both hero and sidekick, was required to carry over half the dialogue scenes by himself, and he handled the acting challenge extremely well, making the two brothers seem like entirely different characters. His Alan was calm, serious, and thoughtful, while his Jack was easy-going and impetuous. Richmond’s performance, along with the fast-moving script and the action scenes staged by director William Witney and stuntman David Sharpe, made Spy Smasher one of Republic’s greatest hits, a cliffhanger that is still rated as one of the best ever made. Above: In a trick still, Kane Richmond as Alan flies an airplane while Richmond as Jack prepares to spy out the ground below in Spy Smasher (Republic, 1942). Above: Kane Richmond as Alan jams his gun into an elevator’s gears to avoid being crushed in Spy Smasher. Richmond continued to work steadily as a supporting actor and occasional lead for Fox and some independent studios, while also making training films for the US Army. His next serial was Haunted Harbor (Republic, 1944)–a colorful, action-packed adventure, and easily Richmond’s second-best starring serial, though not nearly as good as Spy Smasher. In Harbor, Richmond played Jim Marsden, a schooner captain in the South Seas who was accused of a murder he didn’t commit; his search for the murderer led him to the “haunted” island of Pulamati, where he encountered a gang of criminals trying to scare people away from a cache of sunken gold with a mechanical sea monster. The mastermind of the criminal operation, Carter (Roy Barcroft), was also the real murderer, and Marsden managed to unmask him in the final chapter. Richmond brought some added personality to his basic character, and helped the viewer identify with Jim Marsden as he struggled to clear himself. 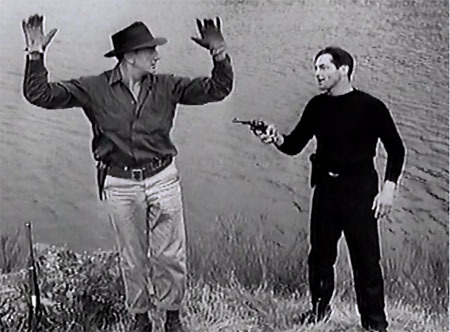 Above: Kane Richmond gets the drop on Bud Geary in Haunted Harbor (Republic, 1944). 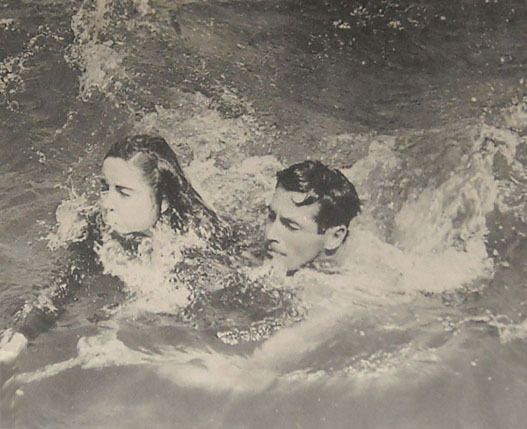 Above: Kay Aldridge and Kane Richmond swim to safety after a shipwreck in Haunted Harbor. Richmond’s next film role was in the 1945 Columbia serial, Brenda Starr, Reporter. As Police Lieutenant Larry Farrell, he was second-billed, but had little to do in this outing but serve as a periodic deus ex machina for the brash Brenda (Joan Woodbury) and her reporter sidekick Syd Saylor–helping them out of dangerous situations when their investigations of a payroll murder and a gangland murder got them into trouble. When not providing backup for the newshounds, he exchanged some weakly-written verbal barbs with Brenda, and reacted with rather exaggeratedly registered comic frustration to her acts of nosy recklessness. Saddled with broadly unfunny dialogue, he was often forced to play his Brenda role with corresponding broadness, conveying comically flustered irritability instead of heroic assurance–but still managed to show flashes of his typical affable charm and authoritativeness at times. Above: Kane Richmond carries the unconscious Joan Woodbury out of a collapsed mine shaft in this scene from Brenda Starr, Reporter (Columbia, 1945). Richmond went right from Brenda to his next serial, Jungle Raiders (Columbia, 1945). This cliffhanger, the best of his three Columbia outings, starred him as Bob Moore, a World War 2 veteran assisting his scientist father (John Elliott) on an expedition to Africa in search of a remarkable curative fungus. Both father and son became entangled in the schemes of trading post owner Jake Rayne (Charles King), who was after the treasure owned by the guardians of the fungus, the lost Arzec tribe. Young Moore also tangled with a scheming witch doctor (Ted Adams) and Jake’s volatile associate Cora (Veda Ann Borg) before helping his father to reach his goal. Jungle Raiders benefited from extensive location shooting and a plot that threatened to become overcomplicated but never did. Richmond shared screen time with a very large and interesting cast of heroes and villains, and thus didn’t dominate Jungle Raiders as he had Spy Smasher. However, his down-to-earth performance still commanded attention and served as a good counterweight to some boisterously hammy turns by his co-stars, particularly King and Borg as the greedy villains, Carol Hughes as the bloodthirsty Arzec high priestess, and Eddie Quillan as the comic sidekick. Above: Kane Richmond makes a radio call while Eddie Quillan (left) and Jack Ingram (right) watch in Jungle Raiders (Columbia, 1945). 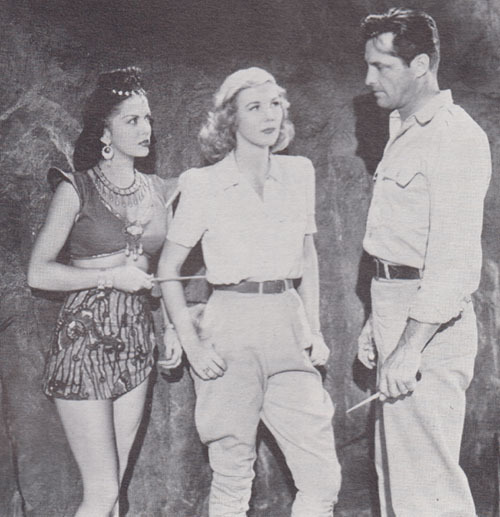 Above: Kane Richmond confronts Veda Ann Borg (center) and Carol Hughes in Jungle Raiders. In 1946, Richmond starred in an assortment of B-films for Republic and Monogram, including three Monogram mysteries that cast him as Lamont Cranston, alias the Shadow. In 1947, he returned to Columbia for his final cliffhanger, Brick Bradford (which was released early in 1948). Richmond, of course, was cast as Bradford, an adventurer who battled an evil scientist (Charles Quigley) to keep a dangerous “Interceptor Ray” from being used for evil purposes. Bradford was based on one of the comics page’s best adventure strips, and featured some potentially interesting science-fiction sequences like a trip to the moon and a journey to the past via time machine, but the serial’s low budget made the final result unimpressive. The cliffhanger’s script was also uneven, veering from straight-faced adventure to near-comedic shenanigans. Richmond, however, handled his lines well, delivering them with a mixture of cheerfulness and quiet conviction–whether he was battling 18th-century islanders, tackling moon men dressed in shorts and giant helmets, or bemusedly reacting to the tongue-in-cheek antics of his sidekick Rick Vallin. Above: Linda Johnson and Rick Vallin haul Kane Richmond to safety in Brick Bradford (Columbia, 1948). Above, from left to right: Pierre Watkin, Leonard Penn, Linda Johnson, Rick Vallin, Kane Richmond, and Wheeler Oakman in Brick Bradford. After Brick Bradford, Richmond made only one more film, the 1948 Monogram drama Stage Struck, in which he played the villain, a charming but ruthless racketeer. He then retired to a successful second career as a sales representative in the fashion industry. Throughout his post-Hollywood years, he was pleasantly surprised by the number of letters he received from fans who remembered his serial performances. He died in Corona Del Mar, California, in 1973. Kane Richmond’s talent and personality shone the brightest when he was given the chance to star in an above-average cliffhanger like Spy Smasher, but that same personality invariably brightened his lesser serial outings as well, even when he was handicapped by bad direction or weak scripts. It’s hard to imagine what his popularity with fans would be like if all of his vehicles been of the quality of Spy Smasher, considering the high place he already holds in their esteem for his actual serial work. Above: A final shot of Richmond as Spy Smasher. Acknowledgements: For the information on Richmond’s early life and career and on Devil Tiger in particular, I am indebted to a 1996 article by Joe Collura, published in Issues 24-25 of Cliffhanger magazine in 1997. The information about the University of Minnesota and his stint as a film salesman came from several different 1930s exhibitors’ trade publications.